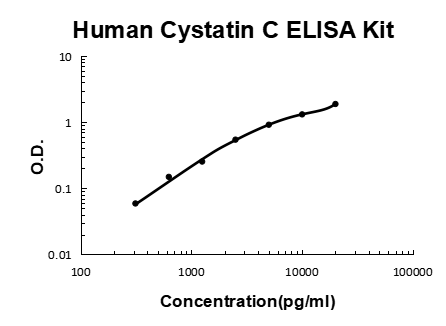 Sandwich High Sensitivity ELISA kit for Quantitative Detection of Human Cystatin C. 96wells/kit, with removable strips. Expressed in submandibular and sublingual saliva but not in parotid saliva (at protein level). Expressed in various body fluids, such as the cerebrospinal fluid and plasma. Expressed in highest levels in the epididymis, vas deferens, brain, thymus, and ovary and the lowest in the submandibular gland. .